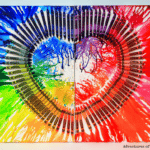 We are on to the next of our very special 31 Days of Love guest posts. We are accumulating a nice amount of Conversation Heart Crafts. 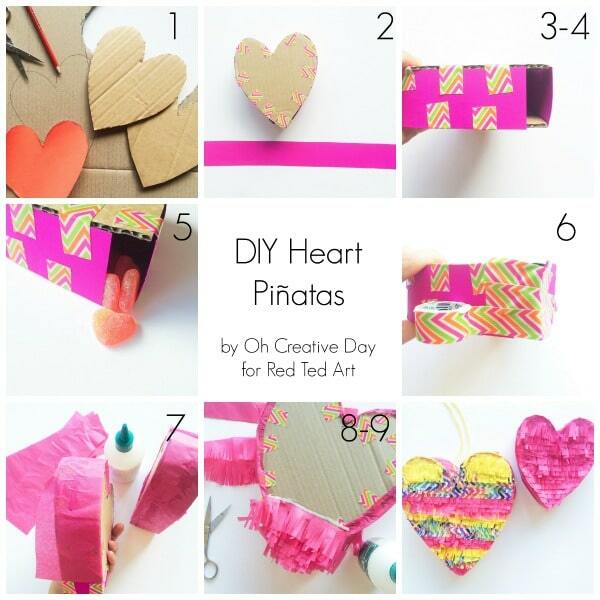 Today we have a brilliant DIY Pinata Heart a wonderful easy heart craft. 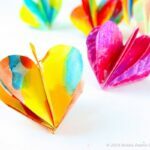 They are so very pretty and actually look pretty easy to make. I am totally inspired. 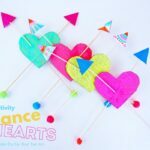 I LOVE DIY Pinatas and I love all Heart crafts!! 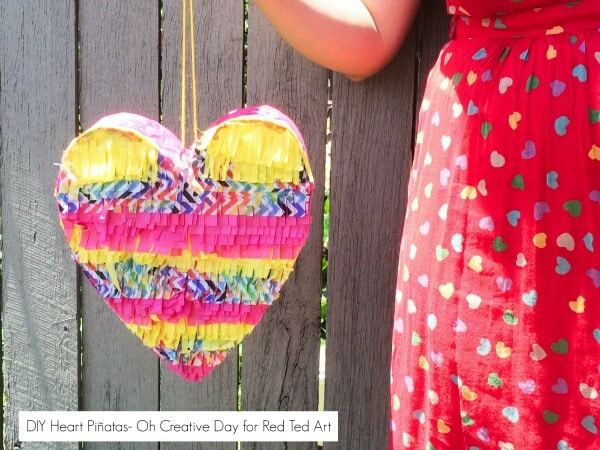 This pinata would be a great Valentine’s Party Activity too. Over to the lovely Shannon for more info! 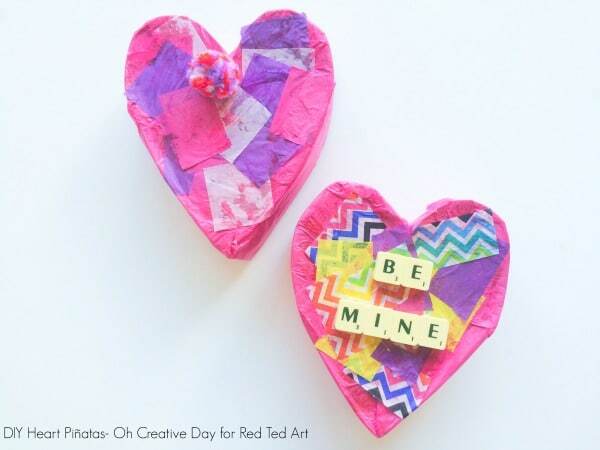 Oh we love Valentine’s Day Crafts for Kids! I’m Shannon from Oh Creative Day, an Australian teacher and mum of 2 kids under 2. I blog about the perfectly-imperfect bits of my creative everyday (aka trying to survive until nap time.) 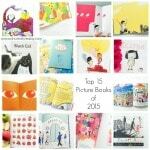 I’d love it if you popped by to join in the celebrations of picture books and craft. 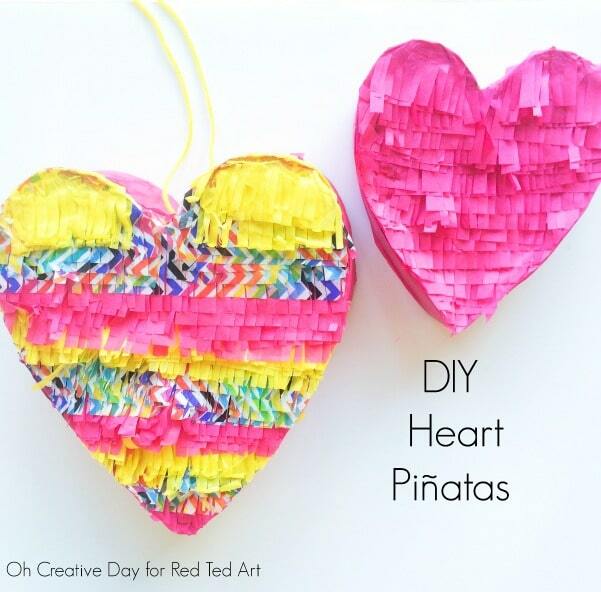 Let’s make some diy piñata hearts! 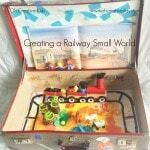 This activity is great for kids aged 6+ with adult assistance. However, my 2-year-old loved sitting beside me and created her own tissue paper collage whilst I created piñatas. And let’s be honest- people of ALL ages love the chance to whack a piñata! 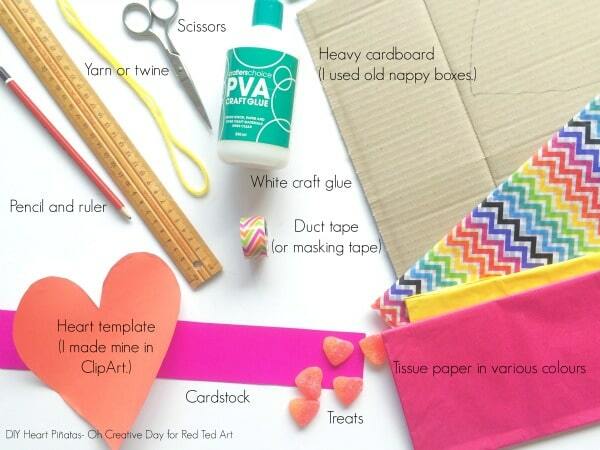 Use your template to trace 2 hearts onto the thick cardboard. Cut them out. Cut a strip of card stock. My strip is about 4 cm (1.5 in) wide. 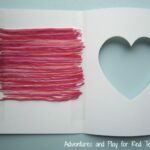 Secure the card stock to the heart base using strips of duct tape at regular intervals, leaving a gap for you to stuff your piñata with treats. Repeat process with lid of heart. The fun part…. Fill your piñata. 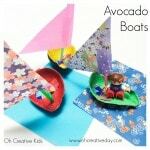 To avoid sugar highs, you could fill your piñata with craft buttons, stickers or love notes instead. Cut strips of tissue paper that are slightly wider than your card stock strips. 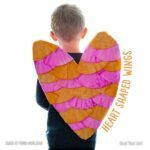 Using white glue, cover sides of the heart with strips of tissue paper. Overhanging tissue paper can be folded and glued over the edges. Cut strips of tissue paper about 2cm wide. Cut thin strips to create fringing. Glue fringing from bottom of heart, overlapping on top of the next strip. Trim excess. If you don’t have the time (or patience!) for fringing, you could collage the tissue paper on and add some simple embellishments. 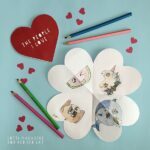 Cut some yarn or twine and tape it to the cardstock at the top of your heart. Hang your piñata and you’re ready! Wishing you all much piñata fun! Thanks so much for having me at Red Ted Art, Maggy! 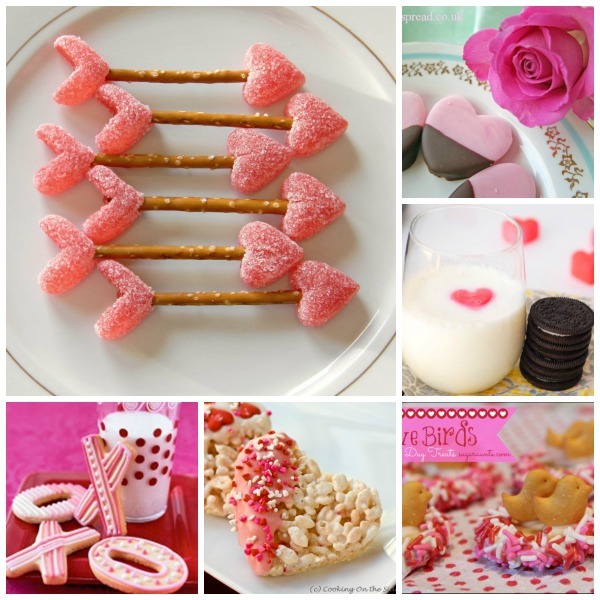 Looking for more Valentine’s Day Party Ideas? How about these brilliant Valentines Treats? 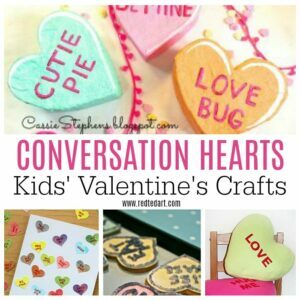 Or why not check out the rest of our Conversation Heart Crafts?